The former Marine Corps Air Station El Toro is being transformed into the Orange County Great Park. Located in the geographic center of Orange County, the Great Park is easily accessible to millions of Southern California residents via freeway or railway. A project area spanning approximately 1,300 acres, with more than 200 acres developed and 688 fully funded acres in planning and design phases, the Great Park embraces recreation, competitive sports, parkland, and the environment; preserves Orange County’s agricultural heritage; and honors the military history of the former air base. Upon completion, the Orange County Great Park will join America’s inventory of national treasures and set a new standard for great metropolitan parks around the world. Amenities already include: the Great Park Balloon, the Carousel, the Great Park Visitors Center, Kids Rock play area, Walkable Historical Timeline, Historic Hangar 244, Palm Court, Farm + Food Lab, and the Great Park Sports Complex. Full Circle Farm Concept at the Orange County Great Park, June 27, 2017, Item 2.4 here. 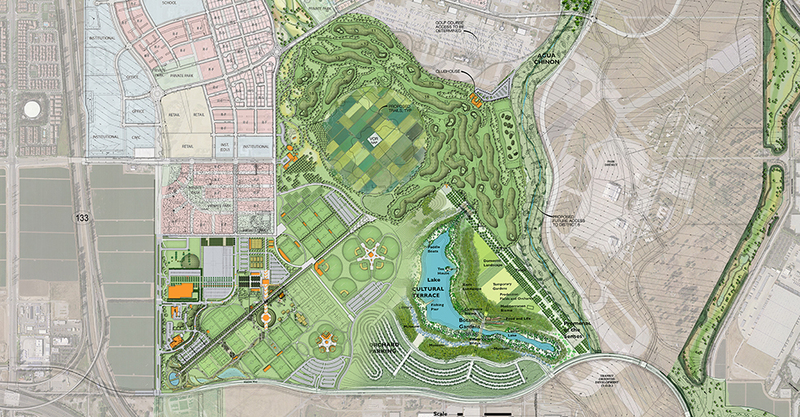 At the November 26, 2013, Irvine City Council meeting, the City Council approved a proposal from FivePoint to develop 688 acres of parkland at the Orange County Great Park. The five-year development, begun in October 2014, planned to dramatically expand the footprint of the built-out portion of the City-owned Great Park and is the exclusive public-private partnership between the City of Irvine and FivePoint, the private developer that owns land adjacent to the Great Park. In a Great Park Board approval on June 27, 2017, the boundary of the Great Park Improvement Area was amended to 688 acres. The approved proposal included a 194-acre sports park that complements the Great Park’s existing North Lawn and South Lawn Sports. The sports park will become a premier recreational and competitive location with soccer and multi-use fields, tennis courts, baseball and softball fields, and sand volleyball courts. In addition, plans include a 170-acre golf course and golf practice facility and clubhouse, 71-acre agriculture component, a 39-acre Bosque area near the Trabuco entrance, 36-acre Upper Bee Canyon area, and improvements that will connect the Great Park to Irvine Boulevard, as well as the 178-acre Wildlife Corridor. The proposal does not impact the Cultural Terrace, which remains part of the Great Park Master Plan and will be developed at a later date. The five-year development of the 688 acres was part of three motions approved by the City Council at the November 26, 2013, meeting that included an adjacent landowner agreement with FivePoint; a General Plan amendment, the first reading of a zone change, and certification of an Environmental Impact Report. The adjacent landowner agreement set in motion FivePoint’s proposal to build the 688 acres along with additional public benefits that have an estimated gross value to the City of Irvine of more than $200 million. Among these public benefits, FivePoint agreed to provide an additional $10 million to the City toward improvement of Marine Way, the main entrance into the Great Park. FivePoint is already obligated to fund major improvements to Marine Way through previous agreements with the City of Irvine. In return for the 688 acres and more than $200 million in public benefit, the adoption of the ordinance allows FivePoint to build an additional 4,606 dwelling units on its privately owned Great Park Neighborhoods development that is adjacent to the Great Park, while reducing more than 410,000 square feet of non-residential development. View ICTV coverage of the 688-acre groundbreaking here. View before and after construction photos through June 2017 here. The Cultural Terrace, a 223-acre portion of the Master Plan for the Orange County Great Park, is envisioned by the Great Park Board and City Council as the next major project at the Park following the 688-acre public-private project area now under construction. 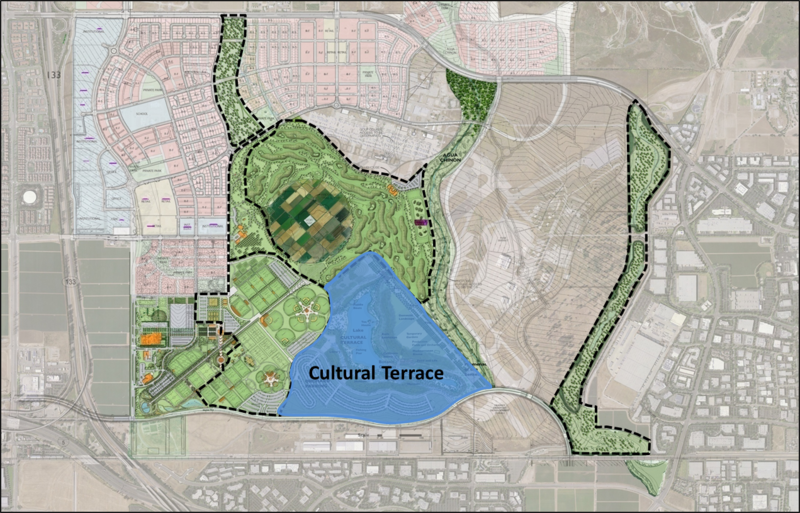 The vision for the Cultural Terrace area includes a variety of culturally oriented amenities, located near the Irvine Transportation Center in the southeastern portion of the park. At an April 24, 2015, workshop, the Great Park Board reviewed the goals and considered several components for the future Cultural Terrace. View the discussion boards from the meeting here. View a Cultural Terrace Joint Studies Update, May 23, 2017, Item 1.1 here. Click here for the Staff Report, Item 3.1, and results of public outreach that was completed regarding the Orange County Great Park for 2016-2017. Click here for a summary of public outreach that was completed regarding the Orange County Great Park from 2004-2010.